My parents purposefully curated a world of possibility and then let me cultivate it for myself. At Christmases over the years, I found Legos and Lincoln Logs, a rock tumbler, a set of electromagnets under the tree. I could be a pioneer, a princess, a kid in a mechanic’s shop. But, without parental diligence, the world of toys can be highly gendered. It shows up in the pink, blister-packed plastic that lines the toy aisles — the props that show up in educational videos, the portrayals of gender that show up in child’s play. Dolls and kits and books have an impact far more profound than their small scale might imply. The ratio is changing in toyland through little acts of online activism. And these little changes can have effects on a far larger issue: how women are seen—and see themselves—in the world of science. In 2011, bloggers rallied against toy kits sorted into boy and girl categories, which resulted in educational toy company Edmund Scientific removing the gendered labels. 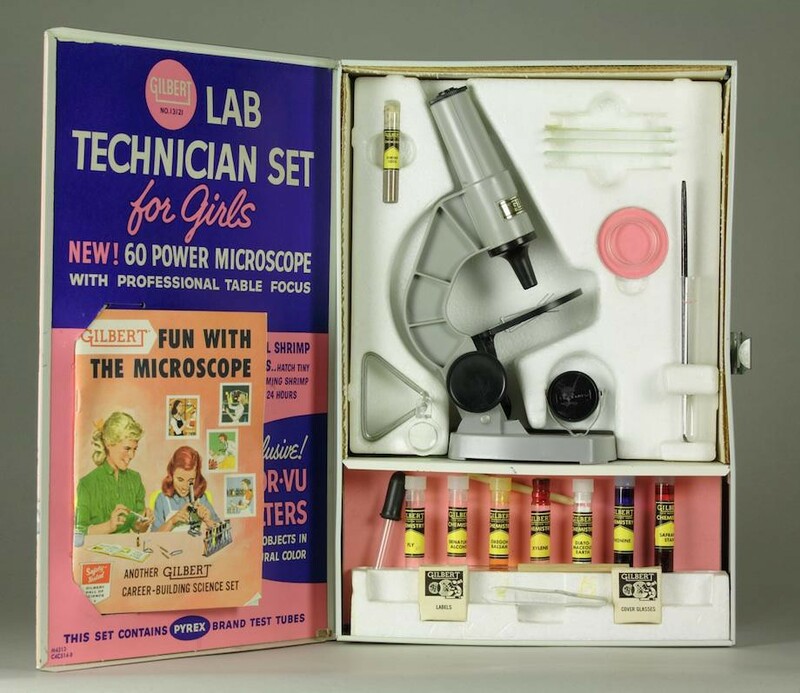 The girl-kits offered aromatherapy experiments, supplies and instructions to make oatmeal masks and bath bombs, and microscopes that were less functional than their blue boy-kit counterparts. Meanwhile, boy offerings were marketed explicitly as physics and chemistry kits. It’s not just Edmond Scientific either—manufacturer WILD! Science still sells gender separated science kits, promising boys lessons in mass and acceleration via “moon balls, slime monsters and fart putty.” Girls get DIY lip balm, perfume and soap. These labels have a direct impact on the way that children see themselves. In response to bloggers and letters, Edmund Scientific issued a statement: they were merging the boy/girl categories — and nixing some of the highly gendered stuff altogether. WILD! Science’s website has a whole section explaining its choice to keep the gender separation alive. Currently, there is a petition underway to begin a collection of female scientist Lego people, and to produce more Lego-women in general. According to the petition, just 16% of all people in Lego-land are women. One-quarter of these are from the marketed-to-girls Lego “Friends” line, which features horse stables, a beauty parlor, and pinkwashed packaging. But boy Lego people get to be astronauts, cowboys, pirates, and explorers. “Girls can’t be what they can’t see and we demand more examples of girls and women that celebrate our intellect, courage, and creativity,” writes Melissa Wardy on the Change.org petition page. In December, an educational (and highly criticized) PBS Digital Studio video featured bobblehead dolls of Albert Einstein, Ben Franklin, Charles Darwin, Galileo Galilei, Nikola Tesla and Marie Curie. The springy-headed scientists sat around a dinner table, mimicking the male-dominated ratio (and some of the sexist remarks) that many women face every day. When criticized for only featuring one woman, the producer pointed out that Marie Curie was the only lady-scientist offered by the bobblehead manufacturer. In response to the video, the Twitter hashtag #bobbleheadsci emerged to nominate female scientists to be rendered as bobbleheads. To their credit, bobblehead manufacturer, @bobbleheads, picked up on #bobbleheadsci. Soon, there was a poll and a promise: “Which lady scientist would you like to see as a Bobblehead?” From the looks of it when the poll closed, biophysicist Rosalind Franklin may be available for sale on their website in the months to come. For all the discussion and action and spilling of virtual ink that feminists do on the internet, a single toy company removing a partition or adding a product can seem like an incredibly incremental victory. But unimportant? Nope. Like casual sexist jokes, the lack of women and girls on toy shelf are microaggressions: the tiny things that chip away at the idea that girls, women, are meant to be scientists. Microaggressions are countered with microchanges. They are countered with reminders that women have, in fact, been around doing physics and chemistry for centuries. They are countered with boxes that advertise the magic of chemicals and explosions to children of all genders. These changes are the result of shifting perceptions. And their benefits go beyond just having another female bobblehead. On the internet, these activist efforts are highly visible. They are an opportunity to get the attention of and involve people who might have never stopped to think about the number of women in their departments, labs, award lists. The realm of toys themselves is an easy place to point out inequality—a small, concrete example of how a cultural divide roots its way into the tiniest aspects of our lives. And so, in shifting perceptions, they’re also a good place to begin. And who knows: maybe somewhere a little girl will see her future self in the caricatured, bobbly mug of history’s greatest X-ray crystallographer. Thanks to Sooz Kim and Hannah Waters.